If you are looking for the best way to stay warm this winter, check out this full length quilted coat. Not only is it beautiful, it also provides ultimate warmth in cold weather. The coat is quilted in circles throughout with layers of lightweight polyester batting. It is presented in your choice of a bold pink or black. It features wide lapels and a single button front closure. The sleeves are long and well fitted. The hemline ends well below the knees. This coat features two, deep side pockets that are just the right size to warm the hands or to hold wallets and other small items. 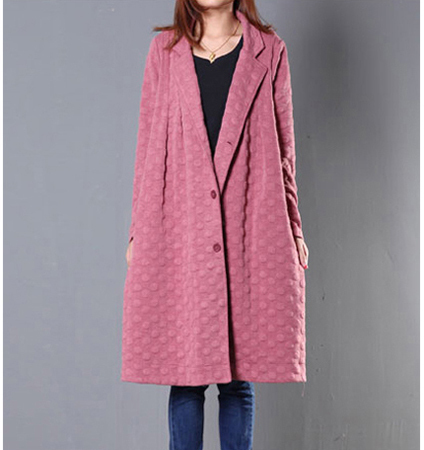 This coat is available for purchase in sizes Medium, Large and Extra Large.